The journey began in April 2017. Dr Gbolade Oshinowo (erstwhile Special Assistant on Political Matters to ex-President Olusegun Obasanjo), Basorun Adebisi Adesanya, Chief Olu Okuboyejo, Sen Dipo Odujinrin, Aare Olu Teslim Dawodu, Chief Bisi Rodipe, Chief Olusoga Adenusi, Tokunbo Oshin and a few other prominent sons and daughters (both technocrats and politicians) of Ijebu and Remo, all of the All Progressives Congress (APC) platform, formed the Ijebu Agenda. The promoters of the 2019 Ijebu Governorship Agenda saw the needs for the birth of the pressure group. It swiftly rose against the attempt to exclude the Ogun East Senatorial District from the 2019 governorship contest. In a bid to persuade the state governor, Ibikunle Amosun to shift his ground, on monday, July 17, 2017, a delegation of Ijebu and Remo leaders met with him on July 14, 2017 at the governor’s office in Abeokuta. Amosun had made it abundantly clear at several public gatherings that he would support Ogun West governorship agenda but would neither prevent nor campaign against Ogun East but will campaign against any aspirant from Ogun Central. This position has pitched him against that of Chief Olusegun Osoba’s, ex-governor and a leader of the APC party, who said described the governor’s position as his personal opinion and not the official position of the party in the state. In consequence, Osoba was not spared of scathing attacks over his rejection of the zoning arrangement. Osoba, who is rooting for Ogun West to produce the next governor has alienated himself from his support base in Ogun East as some aggrieved Ogunt East elders, leaders and youths perceived his stance as un-progressive and greedy. To further lend credence to the official position of the party, the Acting State Chairman of the APC, Alhaji Tajudeen Lemboye, had a couple of weeks ago stated clearly that the leadership of the party in the state has not zoned the governorship ticket to any senatorial district. He made the disclosure when the Ogun East APC consensus governorship candidate, Otunba Bimbo Ashiru and his entourage, paid him a visit at the secretariat of the party, in Abeokuta on Wednesday. “Feel free to go round the nooks and crannies of the state and canvass for support. The party has not zoned the governorship race to any part of the state. “Though the governor’s preference is for an Ogun West successor, not withstanding, he only emphasised that he was expressing his own personal opinion which he is entitled to”, declared Lemboye. However, unfolding events, culminating in the alignment and re-alignment of forces among active players, in the last one month have changed the dynamics of the political developments in the state. Not surprising and in a bid to stave off imminent defeat of the party, at the 2019 general elections, Amosun has pledged to meet with all factions of APC in the state and reconcile them. The governor, during a Christmas party, with leaders and elders of the party at the state’s party secretariat, Abeokuta, said he would negotiate with factions within the APC, instead of primaries in 2019 Ogun elections. Instead, it is said the governor is considering consensus candidates for all elective posts in the 2019 general elections. To go about it, it was gathered that Amosun has promised to meet with all aspirants for elective positions on the platform of APC and would discuss with them the need to agree on consensus candidates for the 2019 polls. Those to dialogue with, it was learnt, include serving members of the National Assembly and state’s House of Assembly, who are interested in running for another term. Besides, it was said the governor further explained that APC might resort to holding primary elections to elect its candidates, if the meetings fail to agree on consensus candidates, including that of the governorship for the 2019 polls. For an enthronement of transparency and accountability, it was further learnt that the governor promised to ensure that all factions within the state’s APC, ae carried along in the said primaries, while promising to accept the outcome of the primaries in good faith. Meanwhile, unlike the APC, the Peoples Democratic Party in Ogun State has zoned the 2019 governorship ticket to Ogun East. According to Alhaji Sikirulai Ogundele, state chairman of the party, in a recent interview with his party has zoned the governorship ticket to Ijebu-Remo axis, in order for his party to win enblock votes. It appeared the leadership of the party is rooting for Hon Ladi Adebutu, the current legislator representing Ikenne/Remo North/Sagamu Federal Constituency as its consensus governorship candidate. However, the leadership of the party is polarised along two factions. One one hand, there is the Buruji Kashamu-led faction. He is the senator representing Ogun East district at the National Assembly. He is a force to reckon with in the political equation of the state. The Ijebu-Igbo-born politician is being rumoured to be nursing a governorship bid. 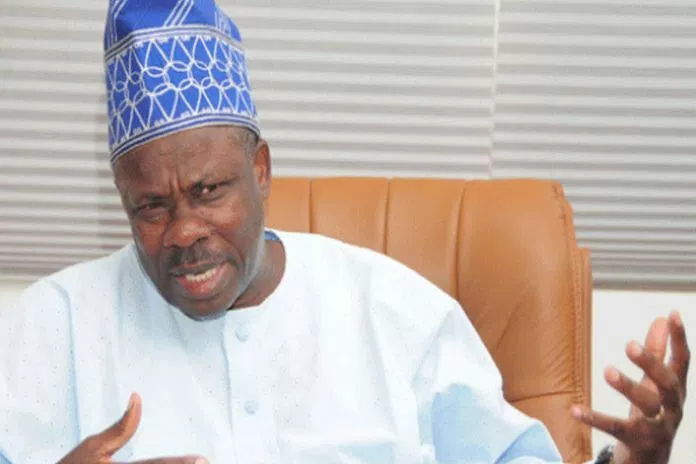 Besides, Dr Gbolade Oshinowo, ex-Acting Chief of Staff to late President Musa Yar’Adua and the chairman, Ijebu Agenda had, in a recent interview cautioned Amosun of the dire consequences of excluding Ogun East district from the 2019 governorship contest. He reminded the governor that Ogun East remained the stronghold of the PDP in the state. “What I am saying is that, Ogun East is already a stronghold of the PDP. Most of us in APC are in a battle ground situation here. And now, to alienate the Ijebus further by zoning the governorship out of their area, by not allowing them to participate makes the position of the leaders of APC in Ogun East very difficult, virtually untenable”, said Oshinowo. On a vantage position, Ijebus have been active participants in politics since February 1976, when the state was created. The district comprises of nine local governments-Ijebu Ode, Sagamu, Odogbolu, Ijebu North, Remo North, Ogun Waterside, Ijebu East, Ikenne and Ijebu North East. It is a district that is more united and in demonstration of its oneness, the axis under the aegis of Ijebu Agenda, presented a common front two months ago, culminating in the choice of a consensus governorship candidate via an endorsement mechanism, devoid of rancour. Not left out, the Awujale and Paramount ruler of Ijebuland, Oba Sikiru Kayode Adetona, has played a leadership role, regardless of political party leanings. He is determined to ensure that that the Ijebus produce the next governor of Ogun State and is leading a campaign that it is the turn of the Ijebus to rule the state. Given the strengths, pedigrees, clouts and acceptability of the strong contenders in the governorship race, Otunba Bimbo Ashiru (the Ogun East governorship consensus candidate), Hon Ladi Adebutu (PDP governorship aspirant of the Sen Ahmed Markafi-led group), Otunba Rotimi Paseda of the Unity Party of Nigeria (UPN) and Sen Buruji Kashamu (PDP governorship aspirant of the Sen Ali Amodu Sheriff-led faction) appear set to determine where the pendulum will swing to. He is the current Ogun State Commissioner for Commerce and Industry. The 54-year-old aspirant is an illustrious son of Ijebu Ode. He is one of the Otunbas of the Awujale. He is well read, graduating with a degree in Marketing, Purchasing and Supply, and a Master’s degree in Strategic Management. He began his career with Chartered Bank which he joined in 1989 and rose through the ranks to emerge as Group Head, Public Sector, Stanbic IBTC Bank until he disengaged after two decades and was appointed Ogun State Commissioner for Commerce and Industry in 2011. His biggest joker, it was learnt, is his closeness to the Awujale. Aside that, he is reputed to be a close associate of Amosun and their relationship has spanned over 20 years. Besides, he is said to be one of the star performers, loyal and trusted commissioners in the kitchen cabinet. Thus, his achievements are by no mean a rare feat with an unprecedented impressive performance. He said to have changed the story of the state’s commerce ministry from the previous label of a ‘dumping ground’ for non-performing coommissioners to that of the ‘goose that lays the golden eggs’. As a testimony, no fewer than 50 companies have established businesses in Ogun State, with a cumulative investment profile of about N691.77 billion in 2014, compared to N377 billion in 2013. To many political pundits, Ashiru is being considered as the most ideal and qualified governorship aspirant in this context, given the complexity of the political vagaries that produced him, as the Ogun East APC consensus governorship candidate. He appears to be above his other co-aspirants in the race. Born on February 25, 1962 into the family of Sir Kessington Adebukola Adebutu (a multi-billionaire business magnate), ‘Lado’, as he is fondly called, hails from Iperu, in Ikenne Local Government Area of Ogun State. A PDP stalwart, Lado is currently representing Ikenne/Remo North/Sagamu Federal Constituency at the National Assembly and he is also the House Committee Chairman on Agriculture and Rural Development. After his secondary school education at Igbobi College, Lagos, he proceeded to the Republic of Ireland where he obtained a BSc (Hons) degree in Analytical Chemistry in 1984. He, thereafter, ventured into business and he is today a major player in animal husbandry with his livestock farm, Kessington Agro-Allied Limited, covering a large expanse of land in Iperu.